24 Sep Fall Planting Season Has Arrived! Fall officially arrived on Wednesday, September 23rd. What a spectacular week we have in store! The weather is sunny, the temperatures are perfect, the nights are cool, and the conditions are ideal for planting. We are fully stocked with gorgeous fall blooming perennials. I just returned from my annual camping trip in the Adirondacks and was simply astounded upon my return at the diversity of plant material on our benches and the beautiful displays that my staff had created. Blue Caryopteris and ‘Sienna Sunset’ Coreopsis are a unique combination for your fall garden. Fall is the ideal time to plant as the soil is warm and roots just take off. You can plant anything from grass seed, shrubs, trees, perennials, cold tolerant annuals, and, of course, bulbs. Fall is also the time to decorate and celebrate the season. We have funky and unusual pumpkins, small bales of hay, and everything else you will need to dress up your front porch for this time of year. Take advantage of our Custom Potting Station to replant your tired summer pots with fresh annuals, frilly kale, winter pansies, and other lovely flowering plants. You can even include some perennials which can later be added to your permanent collection in the garden. This Saturday morning I will be giving a free workshop and garden walk all about Planting the Fall Garden to Support Migrating Monarchs. Even up in the Adirondacks, we had monarchs flying around, enjoying the nectar from all the asters, clover blossoms, and other wildflowers. Asters are one of the primary perennials that all of us need to plant to support not just the migrating monarchs, but also all kinds of pollinators that are so hungry for nectar at this time of year. And BOY do we have the best selection of asters you have ever seen, more than 18 distinct varieties including many that won’t be fully in bloom until next month. Aster laterifolius ‘Lady in Black’ is so pretty in our garden by the road. 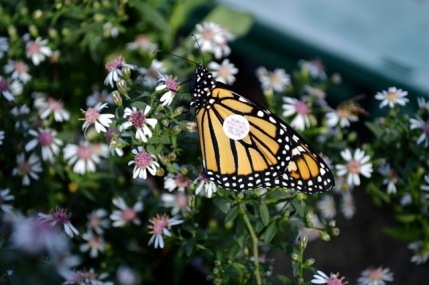 Here you see one of our tagged monarchs taking advantage of this nectar flower. Asters come in every size and many colors, including soft blues that contrast so beautifully with the oranges, yellows, and russet tones of fall. Some are excellent groundcovers, others reach 4-6′ tall and will fill a vase with fresh cut flowers. All along the sides of the highway on my journey north I enjoyed the sight of New York and New England asters. Other species that naturalize beautifully include Aster spectabilis (Showy Aster), Aster oblongifolius, Aster laevis ‘Bluebird’ (Smooth Aster), and Aster azureus. Yes, we have them all. 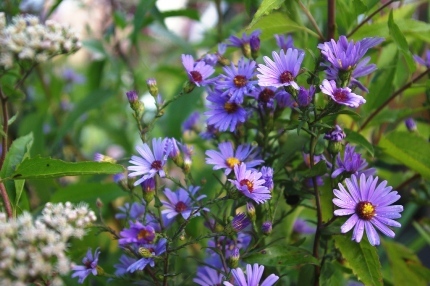 In our gardens we grow Aster tartaricus, a fast spreading, 6′ tall specimen with blue flowers in October. We now carry the shorter version, ‘Jindai’, which only grows 3-4′ tall. It looks so pretty combined with ‘First Light’ perennial sunflowers (Helianthus salicifolius). I LOVE Aster laevis ‘Bluebird’, the smooth aster. 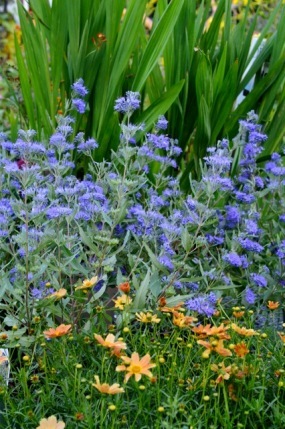 It is native, easy to grow, and a deep shade of blue. I has reseeded in my gardens and I now have four plants instead of one! 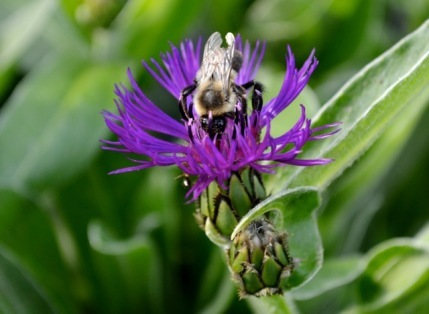 Centaurea montana ‘Amethyst Dream’ reblooms reliably in the fall. Bees flock to it in our gardens. buttons (Centaurea). White Calamintha, ornamental oregano ‘Hopley’s Purple,’ Persicaria ‘Firetail’, Russian sage, perennial mums (12 kinds in stock and counting) and of course Sedums galore are all filled with flowers right now. Our gardens continue to buzz with life and yours can too. Fall decorating is in full swing. 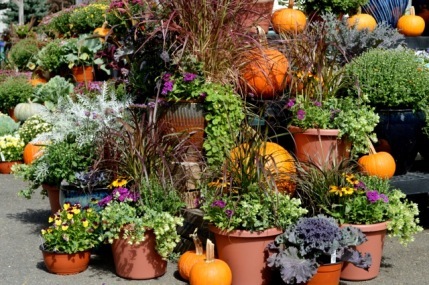 We have everything you need including unusual pumpkins, pretty containers already planted, fall pansies, and more. In our neck of the woods, this week is officially known as Fair Week. The Durham Fair, our state’s largest agricultural fair, runs from Thursday thru Sunday. Diane and I will be giving a talk about raising and caring for Monarch butterflies at 3 pm in the teaching tent. I love to go and look at all the flowers, fruits, vegetables, and animals on display. We are open 7 days a week, be sure to stop by Natureworks if you are coming back from Durham or heading to the fair. It’s right up the road. 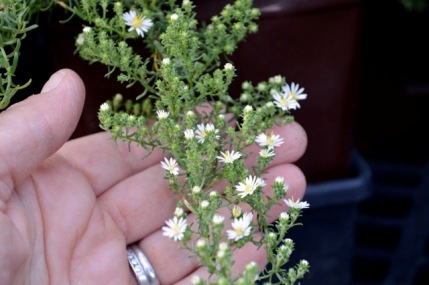 This is a wonderful, native dwarf ground cover aster called Aster ericoides ‘Prostrata’. Ericoides refers to the leaves that resemble heaths (Erica) and heathers. Imagine how pretty this would look in the foreground of your garden. My creative, young staff is offering a new, unique workshop on Sunday. It’s called Kokedama! I have seen this all over Pinterest and Instagram and it is such a cool method of hanging plants using moss. 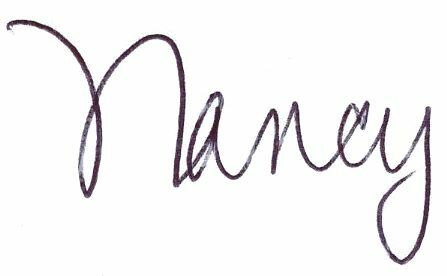 The details on this and all of our activities can be found below in our Calendar of Events. And don’t forget to mark your calendars for October 3 and 4th, our annual Bulbs for Breast Cancer fund raiser and celebration of flower bulbs. We will have refreshments, games, and a few demonstrations and talks about how to plant and design with bulbs. Each year we donate money to After the Storm, a wonderful group that assists breast cancer survivors heal emotionally, spiritually, and physically. 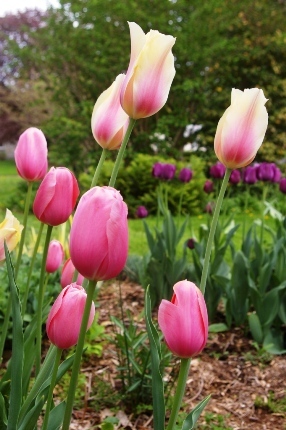 ‘Blushing Beauty’ tulips are so statuesque in my garden, underplanted with ‘Menton’ French tulips. I used Repellex Systemic when planting and they were untouched by varmints. Pick out your bulbs NOW, even if you won’t plant them till October. The wonderful varieties really do sell out fast. Our Bi-Weekly Specials change this week and we are putting all fall blooming anemones as well as three classic shade plants (Hostas, Cimicifugas, and Astilbes) on sale. When you visit, be sure to always check our Thrifty Gardener’s Bench, where the deep discount plant bargains change daily. Other sales include chopped straw (perfect for reseeding lawns and late fall veggie gardens) and select Dr. Earth fertilizers. We still have some organic veggie seedlings available and they are half price until they are gone. Keep on planting!